Out of all the potential accident scenarios that every driver would like to avoid, a rollover crash is inevitably one of the scariest situations that we would all like to never find ourselves experiencing. Fortunately, most of us never will. According to the National Highway Traffic Safety Administration (NHTSA), only about two percent of the nearly 9.1 million passenger car, SUV, pickup and van crashes in 2010 involved a rollover. However, when rollover accidents do happen, statistics indicate that they have a higher fatality rate than other kinds of crashes. The NHTSA also reported that rollovers accounted for nearly 35 percent of deaths from passenger vehicle crashes in 2010, meaning more 7,600 people lost their lives in this kind of car accident. WPTV News 5 recently reported that a rollover crash involving two vehicles on southbound I-95 near the Glades Road exit in Boca Raton resulted in a fatality. Florida Highway Patrol found that the accident occurred when a 25-year-old driver lost control of his BMW and spun into a Toyota 4Runner. The force of this impact reportedly caused the 4Runner to flip over several times, and tragically, resulted in the death of the passenger riding in that vehicle. Rollovers are obviously dangerous incidents but, fortunately, they are also avoidable. A collision is generally considered to be a rollover car crash whenever one of the vehicles involved ends up being flipped on its side or rolling over to its roof during a collision which can happen once or involve the vehicle turning multiple times. 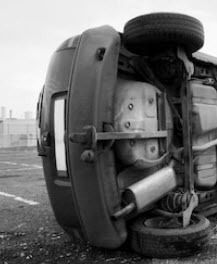 How Do Rollover Accidents Differ From Other Accidents? Because, unfortunately, the bodies of anyone in the vehicles involved in this kind of collision take just as many tumbles as the cars themselves. And there can be a significant force and impact on a body as the vehicle flips and rolls. The extent of the force applied during these kinds of collisions means there is a much greater opportunity to be seriously injured in numerous ways as the vehicle rotates, especially if a vehicle occupant gets ejected. How Can You Help Avoid a Rollover Accident? Never drink and drive. You should also never drive after using illegal drugs and should pay attention to the driving instructions on the label of prescribed medications. Put your phone down. Texting, talking on the phone, and using social media while driving can all distract you from seeing a vehicle that is driving erratically while moving toward you. Always wear a seatbelt. In a worst case scenario, this simple action offers invaluable protection in helping reduce your injuries if you do happen to be involved in a rollover accident. Have You Been Injured in a Rollover Car Accident? Then we can help. If you or someone close to you has been injured in a rollover car accident that was not your fault, you don’t have to attempt to obtain compensation alone. The Florida rollover car attorneys at Leifer Law Firm have helped many injured victims pursue the compensation that they deserve during their 25 years of combined experience. Contact us today for help and we can begin helping you hold the responsible parties accountable.